First of all, what is a heat map? 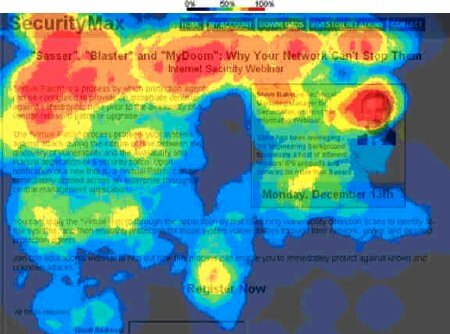 A heat map – as referenced to in web usability – is essentially a graphical overlay on top of a website to show where a visitor’s eyes are going, when on your website. The picture below is an example of a heat map. Keep in mind that red typically represents how “hot” a spot is on your website (a lot of eye traffic), and blue inversely represents “dead” spots (very little eye traffic). What that means for the website owner is that you want to have a strategy about where you are placing your information, links, and pictures. A heat map indicates where to place ads, or revenue generating buttons. If you run a blog or website that depends on revenue based on your ads, then it is essential that you know where your visitors are looking. The difference between a well-placed advertisement and a poorly-placed advertisement, will obviously show in your revenue share paycheck. So find out where your “hot” eye spots are, and cash in on them. A heat map tells you where to place your most valuable links. If you were to prioritize your links in order of value, a heat map analysis will then give you the knowledge of where to place them. This is very important if you are trying to take advantage of “link building” or “backlinks” to more content elsewhere on the internet. A typical example would be the blogger who has extra content on his blog, but the premium articles are found on a different website. He would then make sure a link to his latest article is placed in a hot place on the heat map — for maximum visibility. A heat map analysis will improve your conversion rate. Such an analysis will tell you what your visitors are looking for on your website, and what you can improve. Once you have an idea of what your visitors want, then you can better market to them – thus turning them into recurring, paying customers – which should be the ultimate goal. After all, if you cannot “make the sale”, then your website is not achieving its true purpose, and you need to re-think your business strategy. A heat map analysis of your website can drastically help you improve your brand. Where to place your ads, where to place your valuable links, and improving your conversion rate are all benefits from such an analysis. Making your brand one notch better on the success rung should be a short term goal, as most success stories are about people who are never satisfied because they are always open to how they can improve their offerings. Why not consider a heat map analysis, and see how you can improve your website usability today!